You just saw Wonder Woman and you we’re impressed by the bravery and superhero instincts of Amazonian Diana. While the movie and comic are works of fiction, did you know that a champion like her exists in DFW? 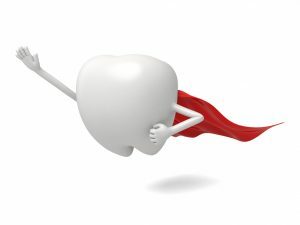 Dr. Shweta Sinha, your premier emergency dentist in Keller, may wear a dental coat instead of a cape, but when urgent oral health situations arise, she swoops in to save the day. In this post, learn what steps to take in some common dental emergencies. What Dental First Aid Tips Should I Know? As your trusted dentist in Keller, Dr. Sinha likes to encourage patients to practice prevention as the best first aid. Wearing mouthguards during activities like contact sports – or even bicycling – can do a lot to prevent trauma to your teeth, and even reduce the chances of CTE, or concussion-related dementia and mental deterioration. If you do find yourself in the situations below, stay calm and call us right away at (817) 993-4146. Pick the tooth up by the crown (the part you chew with). Gently rinse it off with cool tap water, but be careful not to disturb any tissue that may be attached to the tooth. Try to place the tooth back in its socket. If you’re unable to do this, place the tooth in a glass of milk. Chips, Breaks, & Cracks – If this happens, collect any tooth fragments and store them in a glass of milk. You can also rinse with salt water and spit the solution into a cup to make sure you don’t overlook any of the broken pieces. Then, apply a cold compress to the outside of the mouth. Reach out to us right away and don’t use over-the-counter dental cement to try to fix the problem yourself – this will only complicate correct professional treatment. Toothache – Did you know that toothaches are actually considered dental emergencies? This is because oral infections that cause pain can quickly become dangerous. If you have a toothache, floss gently, but thoroughly, in the area and rinse with warm salt water. Then, schedule an appointment with us as quickly as possible. Should I Go To The Hospital In A Dental Emergency? Jaw Injury – If you fall, are in an accident, or even an altercation and are experiencing pain in your jaw, go to the hospital right away. Sometimes, ER doctors can overlook a broken jaw, so follow up with us for a second opinion if you’re still in pain after you’re seen by emergency physicians. Bleeding – Lacerations and trauma to the cheeks, lips, and tongue can be alarming due to the amount of blood lost. If this happens, apply a piece of sterile gauze that’s been moistened in salt water to the area or a wet tea bag, and use firm, but gentle pressure to stop the bleeding. If this continues after 15-20 minutes, go immediately to the closest hospital. The best thing you can do to treat dental emergencies is to prevent them with routine care, so schedule an appointment with Smile Refined: Family Dentistry today. But if you need us when accidents happen, we’re happy to be your smile superhero!